Stories and commentary about college basketball around Boston. At halftime of Harvard and Michigan State’s Round of 32 matchup, the only question seemed to be how many points the Spartans would end up scoring. The No. 4-seed and East Regional favorite led 45-33, and it felt like the score could have been even more lopsided. Nothing the Crimson tried could slow down what might be the nation’s hottest offense, a fact that was punctuated with two dunks early in the second half, stretching the Spartans’ lead to 16. And then, over seven-and-a-half minutes, Harvard totally changed the game. In that span, the Spartans committed seven turnovers — after giving the ball away only twice to that point — and shot just three-for-nine from the field; meanwhile, the Crimson’s offense was nearly perfect, with several points earned in the paint complemented with key three-pointers. 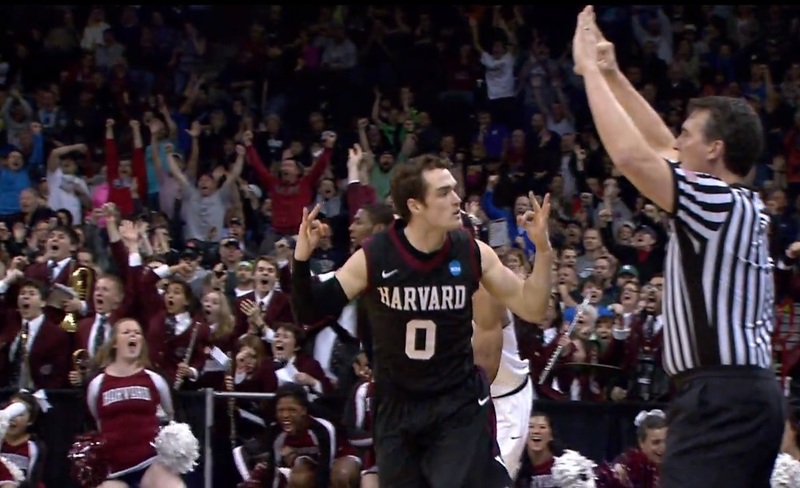 By the time Laurent Rivard made his first trey of the game with seven minutes remaining, producing the screenshot above, Harvard had turned that 16-point deficit into a two-point lead. That lead, of course, lasted only 19 seconds, until Travis Trice answered with a three-pointer, sparking an 11-1 run that ultimately sent Michigan State to the Sweet 16. Throughout the game, the Spartans answered nearly every big Harvard shot with one of its own, showing why it’s on the short list of favorites to cut down the nets at AT&T Stadium in a couple weeks. But by seriously scaring that favorite in Saturday’s second half, the Crimson showed one last time that it was truly a nationally relevant team. Most of Harvard’s run came with a four-guard lineup of Siyani Chambers, Brandyn Curry, Wesley Saunders and Rivard surrounding Steve Moundou-Missi, an alignment that has had iffy results for the Crimson this season. But with starting forward Kyle Casey ineffective (1-for-5, four ugly turnovers, and two frustration fouls early in the second half; he was minus-15 for the game), Harvard coach Tommy Amaker rolled the dice with his small lineup, and it paid off. Jonah Travis played three high-energy minutes, but otherwise, those five played the entire final 17:35 together. The Crimson’s run wouldn’t have happened without a monster performance from Moundou-Missi. The Spartans collected eight offensive rebounds in the first 22 minutes, making a small lineup risky for Harvard; Saunders and Curry checked back to help on the glass, but the brunt of the work fell to Moundou-Missi, who finished with a game-high 10 rebounds. Perhaps more important was the junior’s defense on imposing Michigan State center Adreian Payne. Payne showed flashes of Thursday’s dominant 41-point performance — when a 6’10”, 245-pound center swishes a pull-up 15-footer off the dribble, all you can really do is laugh — but finished the game with just 12 points, four after halftime. Moundou-Missi (and, occasionally, Travis) forced Payne to shoot while moving away from the basket despite a size advantage, contributing to a 4-for-10 shooting performance. With Moundou-Missi manning the interior, Harvard was able to play Chambers, Curry and Saunders together, bolstering its perimeter defense. The Crimson’s rotations were much crisper than they had been in the first half, when the Spartans wreaked havoc with ballscreens, and its guards became more aggressive ball-hunters. In one key play midway through the half, Saunders rotated onto Payne and deflected his pass after Moundou-Missi trapped a pick-and-pop on the wing; Moundou-Missi collected the loose ball near the sideline, raced to the rim and finished with a thunderous dunk for two of his 11 points — all after halftime. Curry, coming off the bench, ended his career with one of the most impactful performances of his senior season. On defense, his energy and quick hands helped Harvard turn up its defensive pressure — his steal set up Rivard’s go-ahead three — and his usual one-on-one defense was generally solid against Gary Harris and the Spartans’ glut of talented guards. And on offense, Curry drilled three triples — two of which kick-started Harvard’s second-half run — and penetrated the Spartans’ defense more effectively than Chambers. And Saunders looked completely in his element against one of the nation’s best teams, showing why he was the Ivy Player of the Year with 22 points, three steals and two assists. He consistently made his way into the paint, taking 10 of his 14 shots at the rim and drawing 10 free throws, and did well guarding the likes of Harris. Most telling, however, was Saunders’ attitude. For a great player, he doesn’t always take over games in an obvious way — but he did so on Saturday, playing at the center of Harvard’s offense for several stretches and attacking defenders. Early in the second half, he turned the corner on a drive and tried to dunk straight on the noggin of Matt Costello; he lost the ball on the way up, but it showed his tenacious approach. Ultimately, Harvard’s first-half struggles were too much to overcome. The Spartans’ Branden Dawson scored 20 of his career-high 26 points in the first half, taking advantage of his quickness advantage over Moundou-Missi and finishing fast-breaks after Harvard’s numerous live-ball turnovers. But Harvard’s season had to end sometime — and given its second-half play against a Final Four contender, it ended on a fairly good note. This entry was posted in Harvard, March Madness and tagged Adreian Payne, Brandyn Curry, Gary Harris, Harvard basketball, Harvard Crimson, Kyle Casey, Laurent Rivard, lineups, Michigan State basketball, NCAA tournament, Siyani Chambers, Steve Moundou-Missi, Wesley Saunders. Bookmark the permalink. Only disagreement I have is with the description “fairly good”…I think it’s a good to very good finish, especially if MSU goes to Final Four. Harvard beats a lot of the teams in the round of 32; had they been seeded properly they might have drawn one of them. The Ivy League is better than it has been but Harvard dominated from the start. Tough to call a loss “good,” but Harvard earned respect for all of us. If their League dominance continues, and they must be considered the favorite for next year, their seeding should improve. A Sweet Sixteen run may not be that far off. How important is shot selection, really? How much has fouling increased?